Heart of Obsidian is a turning point in the Psy-Changeling series. This review does not contain spoilers, and is purposely vague to allow readers the pleasure of learning the revelations themselves. However, I do highly recommend that any reader new to this series NOT read this book without going back and reading the previous stories. Technically, it can be said that it stands alone, but so much is revealed, not reading the others first would diminish the experience. He was said to have no allegiances, no loyalties. They were wrong. It was said to fear him. He had the ability to destroy much in the world. They were right. For years, he'd had only one goal. He had searched for his prey. He had found her. Only she had the ability to keep him from crossing an irreversible line. He would never let her go. Considering that some of my all-time favorite reads and characters were created by Nalini Singh, knowing that we would learn the identity of the Ghost (which may, or may not be one of the lead characters - I will not say), and that the PsyNet is on the verge of collapse, my expectations were astronomical for this book. 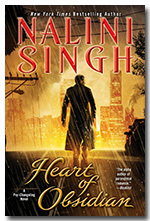 In Heart of Obsidian, Nalini Singh surpassed them all. What words would I use to describe Heart of Obsidian? Dark, obsession, intrigue, friendships, action, and, yes, romantic. In fact, one of the most romantic scenes from this series involves this couple - and I never would have expected it from this hero. I, and so many other fans, are eager to see where Nalini Singh takes us next in this world. FTC Disclaimer: I did receive a copy directly from Nalini Singh to review. However, this website only posts "good" reviews. If I cannot post a positive review, I notify whoever has provided me with the book/ARC/ebook.